Early morning at Deer Park Institute. Have come to see Jetsunma Tenzin Palmo teach on the four noble truths. How could one ever get enough of the Buddha’s first teaching? And so precious to receive from a female, western monastic, a pioneer of the path, an accomplished practitioner, and a philanthropist in her own right. I have come not only for the teaching but to ask her a few questions about my next steps. I need to receive the next set of vows and usually they come in a group. How to find? We also share a common lineage and I will ask her about that and any advice she has for me in terms of practice, dress, and seeking patronage. Deer Park is a sweet place set in the cute town of Bir. It is partially a Tibetan settlement with the requisite noodle cafes, shawl shops, and of course monasteries. We went to sleep under the full moon with the sound of pujas happening all around. Nice. Oh yes, and of course the resounding echos of the dogs barking at each other. So much has happened in the short month that I’ve been in India. THOSAMLING NUNNERY: what a gorgeous place! Set amid golden rice fields in a secluded place without any vehicle roads. One walks there on a narrow path through a rural village. I came to have a favorite baby goat – tethered to a post and a sign that I had taken the correct route. Baaaaaaaaaa! 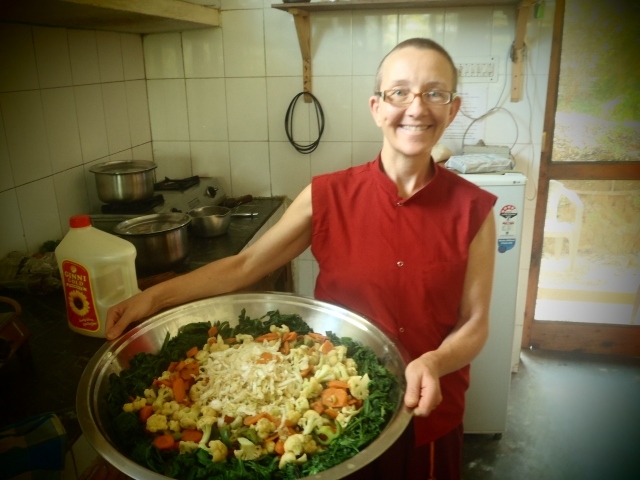 The nunnery is a mixture of nuns from different countries, lay women on retreat, Indian staff, and a learned Geshe. It was wonderful to be with other monastics however I have since moved out to a place with my own kitchen as my health continues to be an issue and with many food allergies I need to cook for myself. Alas! In any case, I made some connections with the people there and am sure to continue friendships. I miss the gardens, the quiet, and the morning prayers with all the nuns chanting in the dimly lit temple as the sun rises over the Himalayan foothills. Yet my skin and stomach are happier with my own food. And the move is a good solution. MCLEOD GANJ: so I have moved into my “old” room in the dirty, noisy, ramshackle town of Mcleod Ganj, or upper Dharamsala. The town I love and hate all at once. Why do I feel so at home there? There is a new house being built above me and I feel as if I’m in the Bardo of Construction. In fact noise seems to trigger me more and more these days. I just want to be alone in silence and practice. This is a rare occasion. I find myself drifting into fantasies of the quiet of Todos Santos last year or the sublime shrine room of the straw bale Hollander abode in Crestone. Silence must certainly be one of the ultimate precious treasures on the planet. Priceless and hard to find! It is of course best if one can transcend the irritations of sensory phenomena, however I am not there yet and could use some strengthening of mind without constant irritation. So a solitary retreat is on my aspiration list. I digress…the move to Mcleod has given me the gift of time with Lhamo at the café. We have put two new items on the menu – brown rice and veggies in a peanut ginger sauce and fresh roasted tomato sauce over penne with pan seared veggies. Yum. It is a good schedule that keeps me focused and allows for time with friends. Usually the whole staff at Lhamo’s plus me eat lunch together. Sometimes I cook, sometimes Lhamo, sometimes one of the waiters. When we can all sit down together it is really nice. India is India. For those of you who have been here you know what I mean. It provides so many opportunities to turn the mind towards being patient, kind, generous, and tolerant. Many things don’t work – I bought a strand of lights, only half the bulbs worked. I bought a stainless steel container, the lid doesn’t fit. The ATM is broken when you need money. The shop is out of the ingredient you need for weeks. And then can I just let go, let go, let go, go with the flow? Somehow I do a better job of it here than in the states. Probably because my expectations are different. One thing I had forgotten is when the shop owners don’t have small change for your bill, you get a mixture of money, cough drops, and matches! That is so funny, no? Despite the challenging parts of being here, there are the lovely parts…walking down the street amid Tibetan monastics, Indian Sadhus, Kashmiri shop owners, Sikh businessmen, Hindu families, and international travelers. The colors and outfits and languages give the feeling of a daily festival. Waking up to the snow-capped Himalaya. Snuggling in to a jam-packed temple for the Dalai Lama’s teachings. "Just this. Just this. Just this. I bow to your robes and I honor the path of you and your fellow nuns. May you be healthy, happy, safe and at ease. muah. miss you. thinking of you. love sarah.